Whether they want love, riches or a just a better life, those in search of good fortune may take their quest to New Orleans, where bartenders conjure up lucky potions by tapping into ritual and folklore. Tonight is St. John’s Eve (a voodoo holy day), and to celebrate, here are seven specialty cocktails created with your good mojo in mind. We don’t make any promises, though when you’re drinking in one of the world’s most enchanting cities, you’re already in luck. While in the mountains of Peru, barman Nathan Dalton noticed women nursing an ancient fertility drink made by soaking whole eggs in lime juice. At Felipe’s Mid-City, Dalton blends and strains his own version of the fertility drink, layering it with Peruvian pisco (grape brandy), passion fruit puree and a float of ginger beer. ¡A Huevo! is juicy and seductive, with an eggy creaminess. You’ll have to plan ahead if you want to make this one as Dalton’s lime-egg juice needs to rest for two weeks. To make the Key lime-egg juice, place 3 whole, shell-on organic eggs in a Mason jar and cover with fresh Key lime juice (from about 24 Key limes). Let it sit in the fridge for 2 weeks, then blend the entire mixture and fine-strain. To make the cocktail, shake the lime-egg juice. Then, in a tall glass over ice, build with juice, pisco, simple syrup and passion fruit puree; top with ginger beer. Among its many powers, lemongrass Van Van is said to clear obstacles and smooth out a new path. According to the author and folklorist Zora Neale Hurston, it was once the most popular conjure drug in Louisiana. Christine Jeanine Nielsen’s cobbler-style pairing of dry, tangy sherry and pineapple shrub is spritzed with a Van Van–inspired tincture, to help steer you in the right direction. Like any perfume, the lemongrass lingers in the air and on your skin. Ask for the cobbler in a pineapple shell, and add a fortune cookie, stuffed with a staff-written surprise. This recipe also requires some advance planning as Nielsen’s Van Van tincture needs to steep for several weeks. To make Lemongrass Tincture, infuse 8 ounces of rye whiskey with ½ cup chopped lemongrass and 3 thin slices peeled and diced fresh ginger. Let it steep for several weeks, or quick-infuse with an iSi nitrous charger. Strain and pour into a small spray bottle. Yields about 1 cup. To make Pineapple–Thai Basil Shrub, bring 4 cups of water to a boil, add 4 cups of sugar and 2 packed cups of Thai basil leaves. Chill, and then strain. Shake together ½ cup of Thai basil syrup, plus 4 cups of pineapple juice, ½ cup sherry vinegar and ½ cup white balsamic vinegar. For the Advanced Lucky Cobbler, shake together 4 ounces of Pineapple-Thai Basil Shrub with 4 ounces of fino sherry. Pour it over crushed ice in two shaker tins or collins glasses (or, if you’re ambitious, a hollowed-out pineapple). Spray on the Lemongrass Tincture. Preparing this sipper starts in a local graveyard, where mixologist Alan Walter clips mounds of morning clover to serve as the drink’s base. At Loa, he gently muddles the greens with white rye whiskey, then releases their grassy notes with a tongue-tingling Chartreuse essence. The emerald tonic is herbal, crisp and potent, sweetened by a fruity powdered rim and the possibility that your glass holds the remains of a four-leaf clover. Dip a coupe glass in the sugar mix. In a mixing glass, muddle the clover with whiskey, then shake with ice and double-strain into the sugar-rimmed coupe glass. Stir in the Chartreuse Élixir Végétal and simple syrup. Garnish with the lemon twist? To summon romance, the voodoo queen Marie Laveau is rumored to have prayed over rose petals and butterfly wings, appealing to Erzulie, the loa (voodoo spirit) of love. Kimberly Patton-Bragg translates Marie Laveau’s love potion as a frothy gin fizz. Silky orange notes roll through the glass, while a floral spirit and a touch of grapefruit let the fresh rose shine. It’s topped with a bloom of Peychaud’s bitters, created in New Orleans during Marie Laveau’s lifetime. To make the Vanilla-Grapefruit Cordial, boil one part sugar in two parts grapefruit juice and a split vanilla bean until all the sugar has dissolved, then cool and strain. To make an Erzulie Fréda, in a tin with no ice, shake together all of the ingredients except the bitters. Add ice and shake again, then strain into a coupe glass and spray with bitters. Red Fast Luck, an old voodoo cure of cinnamon, vanilla and wintergreen, is meant to reverse fortunes quickly, especially for gamblers. Faster than you can say, “Hit me on 17,” comes Steve Yamada’s easy shake of tequila, grapefruit juice and Red Fast Luck syrup. The cinnamon-threaded Red Roulette is refreshing, lightly tart and low-proof. Make this your go-to gris-gris when you want to break a bad streak. To make Red Fast Luck syrup, bring to a boil 4 cups of water, 5 crushed cinnamon sticks, 2 split vanilla pods and 8 black peppercorns. Let cool, then add 2 tablespoons of wintergreen leaves and 2 teaspoons of hibiscus flowers, and steep for 5 minutes. Strain, then add 2½ cups of white sugar and stir until dissolved. Yields about 5 cups of syrup; refrigerate for up to a week. To make the Red Roulette, combine all of the ingredients in a shaker. Strain and pour into a tall glass, filling it about ¾ of the way; fill in with crushed ice and top with soda water. For St. Joseph’s feast day, New Orleanians put up altars in his honor, leaving offerings of candles, flowers, bread and cookies, as well as fava beans, a prized Sicilian crop to honor the Italian island’s patron saint. Carrying a dried fava bean is said to bring you money, as it did for Ryan Iriarte when he was a kid. These days, he keeps fava beans behind the bar, spinning them into a syrup that he combines with rye whiskey and a chewy, smooth rice vodka. Together, they build a cocktail that’s robust, earthy and rich. To make fava bean syrup, toast 1 pound of fava beans in a skillet, then add to 3 quarts of water and 3 bay leaves, and cook over low heat for about 3 hours. Filter through a chamois, then make a simple syrup using 2 parts of fava bean liquid to 1 part white sugar. Yields about 6 cups of syrup. To make Carpenter’s Gold, in a shaker filled with ice, stir together all of the ingredients, except the garnish; strain into a coupe glass and garnish with a bay leaf. Legend has it that spreading crushed red brick dust across your threshold protects your home; voodoo gospel likewise says that tasting red cayenne pepper will keep evil from your body. 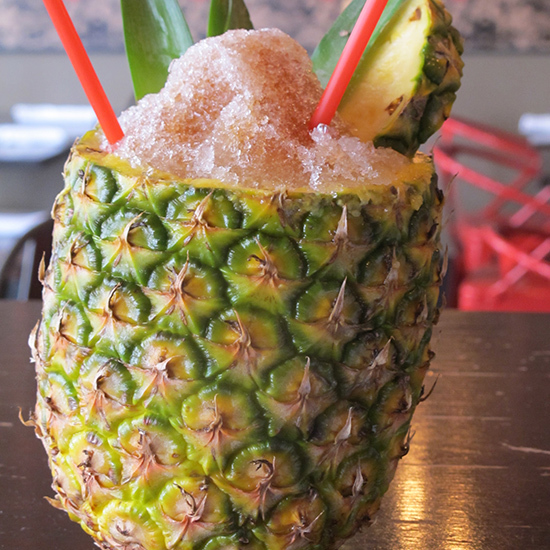 At Cane & Table, a proto-tiki bar with an adventurous Caribbean vibe, managing partner Nick Detrich uses cayenne to circle a genever sour, made with a malty, well-matched gin. Lick the sparked rim between sips, and you’ll find that the cayenne’s heat, like any negative energy haunting you, will dissipate. Coat the rim of a footed pilsner glass with the cayenne-salt mix. In a shaker full of ice, combine the remaining ingredients. Shake and strain into the rimmed glass. Garnish with a cayenne–dusted lemon twist.